"You are hereby directed . . . to accelerate the super booster program for which your agency recently was given technical and management responsibility," Eisenhower wrote Glennan in January 1960. This action ensured the transfer of the von Braun group from the Army Ballistic Missile Agency to NASA,31 giving Glennan the launch vehicle development and management capability that he wanted. Piland's team pulled together some guidelines and began presenting them to all the NASA centers. Piland, Faget, Stanley White, and Robert Chilton spoke, answered questions, and distributed copies of their papers on the aspects of lunar mission planning, leaving the final summary to Gilruth's Associate Director for Development, Charles J. Donlan. Donlan outlined the problems that could be foreseen and solicited "suggestions and proposals as to how best this effort can be carried out. . . . We would hope in the immediate future to obtain your views as to the problems each Center may concentrate on so that the whole NASA effort can be integrated as soon as possible." Following the same general format, the bidders' briefing at Langley on 13 September included a formal request for proposal, a statement of work, and some definite guidelines. Essentially, these ground rules were based upon the assumption that the Saturn booster could launch a lunar reconnaissance spacecraft that would support three men for two weeks. 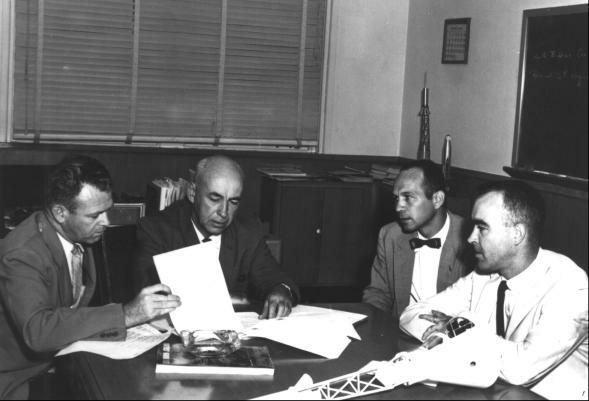 Robert Gilruth (second from left), Director of the Space Task Group, and chief assistants Charles Donlan left), Maxime Faget, and Robert Piland in August 1960 discuss selection of contractors to study feasibility of a manned circumlunar mission. Piland laid out four mission and vehicle guidelines: manned lunar reconnaissance; earth-orbital missions in conjunction with a space laboratory or space station; Saturn booster compatibility (spacecraft weight not to exceed 6,800 kilograms for lunar missions); and a 14-day flight time. Faget stressed return, reentry, and landing: safe recovery from aborts; ground and water landings (with a capability for avoiding local hazards); 72-hour postlanding survival period; landing in preplanned locations; and auxiliary propulsion for maneuvering in space. Richard S. Johnston presented three demands: "shirt-sleeve" environment, three-man crew, and radiation protection. He discussed the need of the crews for a safe environment and for atmospheric control. 31. President Eisenhower to Glennan, 14 Jan. 1960; Admin., NASA, and Acting Secy. of Defense to the President, draft memo, "Responsibility and Organization for Certain Space Activities," 2 Oct. 1959; Glennan and Acting Secy. of Defense Thomas S. Gates to the President, subj. as above, 21 Oct. 1959 (approved by Eisenhower 2 Nov. 1959); House Committee on Science and Astronautics, Transfer of the Development Operations Division of the Army Ballistic Missile Agency to the National Aeronautics and Space Administration: Hearing on H. J. Res. 567 , 86th Cong., 2nd sess., 3 Feb. 1960. 32. ABMA, "A Lunar Exploration Program Based upon Saturn-Boosted Systems," Rept. DV-TR-2-60, 1 Feb. 1960. 33. J. R. Clark, Vought Astronautics, to NASA, Attn. : Silverstein, "Manned Modular MultiPurpose Space Vehicle Program - Proposal for," 12 Jan. 1960, with enc., "Manned Modular Multi-Purpose Space Vehicle"; John D. Bird, interview, Langley, 20 June 1966. 34. John H. Disher, notes on meeting at Langley attended by Silverstein, Gilruth, Low, and Faget, 15 Feb. 1960 (emphasis in original). 35. space Task Group, "Guidelines for Advanced Manned Space Vehicle Program," June 1960, esp. Charles J. Donlan, "Summary and Scheduling," pp. 47-50; STG, "Slides for Advanced Vehicle Presentation," April 1960; Disher to Dir., Space Flight Prog., "NASA Center Briefings on Advanced Manned Space Flight Program," 10 May 1960. 36. John M. Eggleston, Langley Research Center, "Inter-NASA Research and Space Development Centers Discussion on Space Rendezvous, . . . May 16-17, 1960," 25 May 1960. 37. John C. Houbolt, interview, Princeton, N.J., 5 Dec. 1966; idem, "Considerations of the Rendezvous Problems for Space Vehicles," paper presented at the Society of Automotive Engineers National Aeronautical meeting, New York, 5-8 April 1960; I. E. Garrick to Emme, "Item for the historical record of the Apollo Program," 31 Oct. 1969, with enc., Garrick to Chief, Dynamic Loads Div., Langley, subj. as above, 7 Oct. 1969; Bird, "A Short History of the Lunar-Orbit-Rendezvous Plan at the Langley Research Center," 6 Sept. 1963 (supplemented 5 Feb. 1965 and 17 Feb. 1966). 38. Disher memo to Long Range Plan and Budget File, "Meeting with Dr. Glennan on 7/9/60 to discuss long range plans for Saturn utilization by OSFP," 11 July 1960; Disher draft, "Long Range Plan: Manned Space Flight Program," 8 Aug. 1960. 39. Disher memo, 11 July 1960; Merle G. Waugh to Grimwood, 5 Nov. 1963; Lee D. Saegesser, NASA Historical Div., informal memo, "Apollo, naming of," 11 June 1969; William D. McCann, "Dr. Abe Silverstein Certain to Rate in Space Hall of Fame," Cleveland Plain Dealer , 14 July 1969, as cited in Congressional Record , 17 July 1969, p. E6092; Donlan, interview, Langley, 20 June 1966; "Apollo Program Review, October 20, 1962," p. 1; Silverstein to GSFC, Attn. : Goett, "Official Name of the Advanced Manned Space Flight Program," 25 July 1960; Hugh L. Dryden, "NASA Mission and Long-Range Plan," in NASA-Industry Program Plans Conference, 28-29 July 1960 (Washington, 1960), p. 8; Low, "Manned Space Flight," ibid., p. 80; Grimwood, "Mercury, Gemini, Apollo: How They Got Their Names," Manned Spacecraft Center Roundup , 3 Oct. 1969; Felix Guirand, ed., New Larousse Encyclopedia of Mythology , trans. Richard Aldington and Delano Ames (New York: Hamlyn Pub. Group, 1968). Cf. Berthold Laufer, The Prehistory of Aviation (Chicago: Field Museum of Natural History, 1928); Ernst and Johanna Lehner, Lore and Lure of Outer Space (New York: Tudor, 1964); Nikolai A. Rynin, Interplanetary Flight and Communication , 3 vols., 9 nos. (trans. of Mezhplanetye soobshcheniya , Leningrad, 1928-1932; NASA TT F-640-through TT F-648, Washington, 1970-1971); and Gertrude and James Jobes, Outer Space: Myths, Name Meanings and Calendars (New York: Scarecrow Press, 1964). 40. Charles Corddry, "NASA Plans 260 Space Shots in 10 Years; Astronaut in 1961," Washington Post , 29 July 1960; NASA-Industry Conference, 28-29 July 1960 ; Goett, draft memo to Dir., Off. of Space Flight Prog., no subj., 8 Aug. 1960; STG, "Project Apollo: Invitation to Bid on a Research and Development Contract for a Feasibility Study of an Advanced Manned Spacecraft and System," 10 Aug. 1960; Goett memo, "Goddard - Industry Conference," n.d., with encs. ; STG, "Talks for Advanced Manned Spacecraft Presentation, Goddard Industry Conference," n.d.; NASA, "Slides for Advanced Manned Spacecraft Presentation, Goddard Industry Conference," 30 Aug. 1960; NASA, "Presentations for the Industry Conference to Be Conducted by Goddard Space Flight Center, 30 August 1960," n.d. See also Marshall Space Flight Center, "NASA-Industry Program Plans Conference, 27-28 September 1960." 41. STG, "Project Apollo: An Advanced Manned Spacecraft System," draft news release 12 Sept. 1960]; Donlan, "Project Apollo Bidders Briefing," ca. 13 Sept. 1960]; Glenn F. Bailey, "Request for Proposal No. 302, Feasibility Study for Project Apollo," 13 Sept. 1960, with att. A and B and enc., "General Requirements for a Proposal for a Feasibility Study of an Advanced Manned Spacecraft and System," 12 Sept. 1960.